There are distinctive factors that allow students to thrive on a massive movement as seen in the Occupy protests. AGE is an important factor. We can see its importance by comparing the timely examples of pro-democracy movements initiated by the Hong Kong Federation of Students (HKFS, 香港專上學生聯會) and Occupy Central with Love and Peace (和平佔中) by the three adult initiators. Students in their teens are quick, energetic, passionate and full of intellectual vitality. They have their own beliefs and ideals, and spare no effort realising them. Teens naturally strive for independence. Being students, especially under a modern and progressive education, they understand independence from a perspective beyond the individual will. THE setting in which they are placed plays a key role too. Their civil consciousness evolves from their academic environment. Far from being disrespected, subjects such as Chinese History and Social Studies had actually been preserved and taught at school back when Hong Kong was still a British colony. Young people learnt values, rights and freedom as individuals. In the modern age, the information explosion and the pace of interconnection allows better digging of the truth about almost everything. Compare this with youths living under authoritarian regimes. Opinions posted on social media are blocked under heavy censorship. Hardline goverments use propaganda to write out some parts of history while some other parts are amplified from a selective angle. WE were not able to enjoy democracy when Hong Kong was a British colony but at least a relatively high extent of freedom has extended till today. But when we look at the Beijing way we understand how their concept of democracy is different. The reason Hong Kong has been struggling for what we think we deserve over generations is that we can imagine, deep down in our hearts, that the existing freedoms we have would otherwise slip through our fingers. The most recent example would be a long list of arrested individuals in China who expressed support to the students in the current pro-democracy movement in Hong Kong. As least 34 people (including artists and poets) have been arrested as of 6 October. AS vibrant as the city’s economy might look on the outside, it is unfortunately c o nst ru c t e d wi t h systematic monopoly and unfairness because who benefits from a certain policy depends on who ‘represents’ us. The general public or the grassroots are actually getting poorer. Young people find it much harder to make a living and to find housing. They have nothing to lose and hence would not be threatened by tycoons’ economic manipulation. Tactics: they make good use of social media platforms to spread the word, arrange logistics, and update situations. They also keep drafting and printing leaflets to promote their cause abroad, and for massive distribution in all venues. THE tradition of quality student movements came with the fostering of student leaders by Szeto Wah (司徒華) – ‘Democracy’s Foot Soldier’ to Time magazine or ‘Uncle Wah’ to most Hong Kong people. He endeavoured to train up young leaders with the right attitude and ethics, and stressed the importance of zero involvement in money with young community workers. 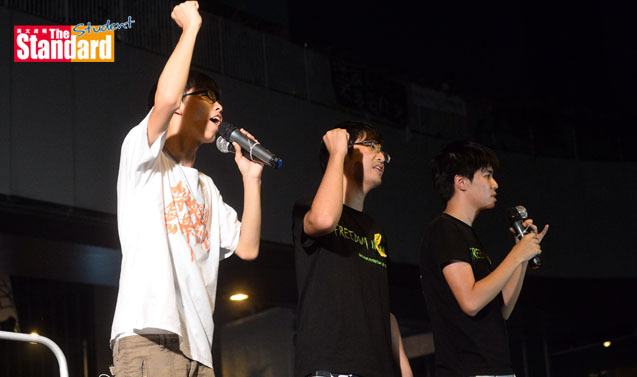 From Tiananmen student movement leader Wu’er Kaixi (吾爾開希) to Chen Wei-ting (陳為廷) from Taiwan’s (台灣) Sunflower Student Movement and today’s student activist Joshua Wong Chi-fung (黃之鋒), these leaders show unwavering courage and leadership that could serve as an inspiration. AS far as this student movement is concerned, there are several unexpectedly significant facilitators to its later development into wide-scale civil disobedience that has taken place on the streets in Hong Kong. JOSHUA Wong of Scholarism was treated to a 40-hour detention after he stormed into the blocked-off Central Government Complex (CGC) along with others. This “unlawful” decision, according to a high-court judge, has sparked discussion and led people to associate it with a political agenda. Joshua’s parents have also called it “political persecution”. PUBLIC sentiment grew rapidly for students and protestors the moment they were targeted with tear gas through a series of short-distance pepper sprayings. Later, when students and other citizens were attacked by anti-Occupy Central citizens (some suspected to have a triad background), the police were accused of having seen what happened without intervening. People were generally furious about the violence towards unarmed Hong Kong citizens. NOT only do they adhere to the non-aggressive principles, students and other participants of the movement, which has become known as the ‘Umbrella Revolution’, have taken the initiative to keep the occupied space clean and protestor friendly. During the week of dominating key districts, amid a strong sense of neighbourhood watch, supplies were piled up along the streets, medical and other aid were freely accessible, students were seen cleaning up the streets after overnight use … there were even recycling bags for used bottles, and water sprays to freshen up protestors walking by – all these episodes foreign media described as “surreal” have won public appreciation.